Cold weather warning! Here’s our motorhome winterisation advice. Whenever you’re not using your motorhome through the winter months, a good drain down is essential if you want to avoid the dangers of freezing water causing pipes, or even tanks and taps, to burst. There’s plenty more you can do to make winters as comfortable as possible for your motorhome. 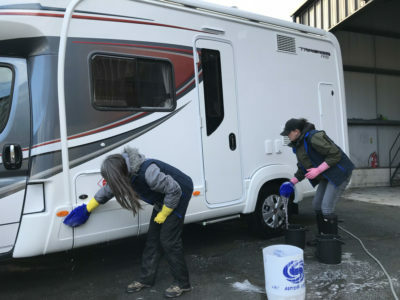 Very few motorhome owners can claim their vehicles are fully winterised, so a bit of diligence is needed – especially if ambient temperatures really do plummet. Please note, your Caravan Guard motorhome insurance policy booklet states that between the 1st November and 15th March, we will not pay for loss or damage caused by water freezing in any fixed water or heating installation, or loss or damage caused by water, steam or other liquid escaping from a fixed household appliance, fixed water or heating installation unless you drain down all your motorhome’s water systems and internal sanitary systems when the motorhome is not in use. Also, remember to let us know if you’re changing where you store your motorhome for the winter. Start by making sure you’re over a suitable drainage point. Chances are, this will mean parking on level ground, but if you can angle your vehicle towards its drainage outlets, so much the better. Open the outlets to your fresh and waste water tanks, including the water heater (if fitted). If your toilet system operates via a separate header tank, now’s the time to deal with this, too, along with the cassette holding tank and the rest of the flushing system. Open all internal taps (and leave them that way until you next use your vehicle). Leave any mixer taps in a central open position. Let your pump run just long enough to push out any excess water. If you have a shower, remove the shower head and shake out any water. Leave the shower piping hanging vertically (so that any water drains out naturally). 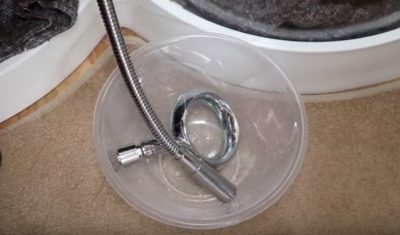 Some motorhomers like to put the end of the pipe and the shower head in a bowl in the shower tray. 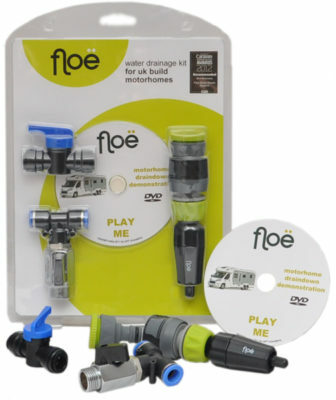 Consider using a drainage accessory like the Floe drain down kit. It forces air through the system to push out those final traces of water. Make sure you haven’t missed a tap or isolator valve. Your owner’s manual should tell you where these fittings are located. Check the fridge – and the freezer. Remove all foodstuffs as well as ice trays etc, and wipe away any moisture. Leaving the door(s) ajar will encourage air circulation and prevent the build-up of mould. Don’t forget items such as an external shower fittings. Go for a short drive, with all drainage outlets open. This will help “jiggle down” any remaining liquids in the systems. When you get back, close any outlets, as appropriate. Wherever possible, though, leave internal taps etc open for the storage period. See also our caravan draining down video. 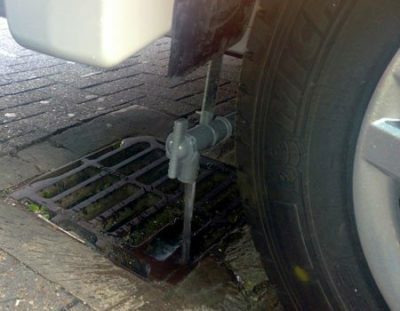 It shows how to drain down a caravan, but the principles are very much the same for motorhomes. Draining down is also an ideal time to clean your motorhome interior, of course. Check manuals for fixtures like the toilet to see if any extra winter maintenance is needed. The onset of winter is also a prime time to make sure your base vehicle is in prime condition. Top-up anti-freeze and oil levels. 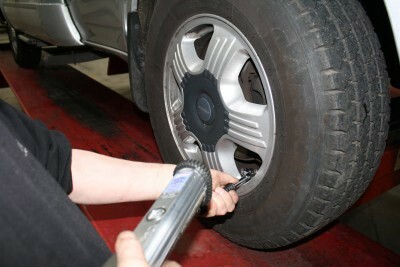 Check tyre condition and pressures. As well as cleaning interiors, consider the exterior. A thorough clean is also an ideal time to check the condition of any seals as well as general bodywork. Coachbuilt bodies, in particular, can benefit from a coating of overwintering fluid. Fit exterior fridge vents (if supplied) – but please do remember to take these off when you use the motorhome. Disconnect the gas supply. Remove any cylinders and store safely elsewhere. If you’re laying up your vehicle for the winter, fully charge the batteries before putting it into storage. Consider investing in a permanently connected intelligent charger. Leisure batteries can fail in the winter – often due to a combination of old age and not getting enough protection from the cold (dedicated battery lockers with exterior-access hatches are serial offenders!). Try and keep them on a trickle charge (via a solar panel, or by removing and keeping at home – as long as this doesn’t affect any security devices). 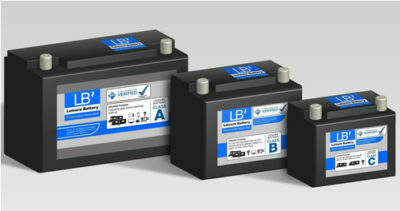 Ideally, such batteries shouldn’t be allowed to discharge below 50% of their capacity. You might want to take out any soft furnishings – including bed/seat cushions – and stowing them in a dry place through winter. This actually also acts as a key deterrent to would-be thieves. Also remove all valuables, including anything of a personal nature. That includes key documentation. The more you can take out of your vehicle, the better. It’s also a reminder of how much you carry around with you when you’re touring (which could have an adverse effect on economy and even handling). Make sure you activate any security devices, like alarms and trackers and fit any extra physical security devices to deter thieves. 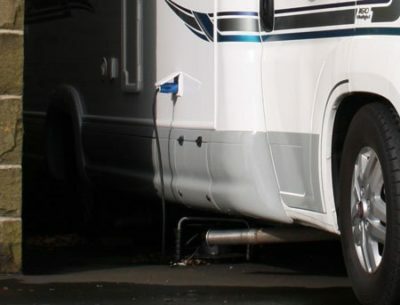 Keeping your motorhome connected to mains electricity can be a major bonus. It might mean you can keep a heater on a low/night-time setting to take the edge of a real chill. Mice, spiders and more might want to take advantage of your otherwise unoccupied vehicle as a cosy home for the winter. Tumble dryer sheets, peppermint oil, wire wool and more are handy deterrents. Do not fully block off ventilation points like gas drop-outs, though. Moisture-absorbing crystals can help take excessive damp out of the interior. They may need replacing occasionally, however. 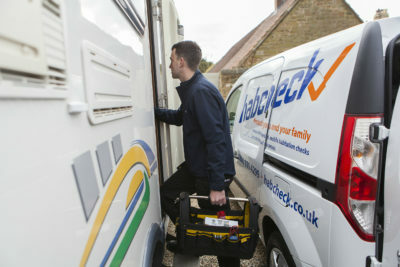 Pre-winter is an ideal time to book servicing for the habitation area as well as the base vehicle. Every motorhome is different. Draw up your own checklist for winter care. Ideally, ocassionally inspect to your motorhome throughout winter, just to check everything is okay. Turning over the engine occasionally will always help. If you can, too, move the vehicle at least slightly so that it’s not resting on the same area of each tyre for extensive periods. Even using the air conditioning will help keep up circulation of its gasses. It will have a de-humidifying effect, too. If possible storing indoors in a garage or undercover will alleviate many of the perils of keeping your vehicle outdoors. Or, consider a motorhome cover. As well as protection from the elements, it will provide a vital extra layer of insulation. 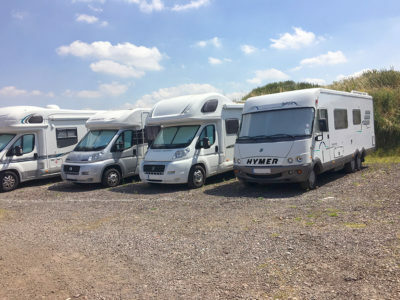 If this all too much to consider, then there are companies like Habcheck who will come out and winterise your motorhome, or you could speak to your dealership to see if this is something they offer. Got any advice on protecting your motorhome in winter to pass on to others? Feel free to add your comments below. Good tips, I’ve made my list thank you. Don’t forget to empty “U” bends especially the ones for the shower tray as (like my van) they are likely to be outside, underneath the van and will freeze easier than the sinks inside the van. Thanks for the top tip Ed. If you have a a motor home such as ours weighing over 3.5 tons make sure you stand it on tyre savers in order to preserve the contour. Also fit wheel covers in order to help the brake discs escape the moisture in the air and therefore the production of surface rust. Also spray inside the chassis inside with Supertrol rust inhibitor or similar. We also spray or hand paint our rear leaf springs with Carplan Tetroseal or similar wax / oil product then wipe all the brake pipes over with the same on a rag so no corrosion starts. We have always done the latter as a five litre can is both inexpensive and very effective. Finally do not foreget your spare wheel in its carrier under the vehicle and check the turn key threads to ensure no rust can form as every year we hear tales of people who get a puncture and simply cannot access the spare wheel simply through neglect and therefore ensuing corrosion. Good advice. Worth including a note regarding aircon. In order to keep it tip-top, fire it up every few weeks so that the system will circulate the gas. This will also de-humidify the air a little. Also worth mentioning the wipers: if possible, leave them off the screen so that they don’t freeze in place and make sure that the screen wash is full strength too. WD40 all door catches and hinges after the wash so that the water does not freeze the locks. Thanks for the extra tips Jonathan. All good advice for first time owners. We are able to keep our moho on our property and can run power to charge battery ect or power a small heater if it gets very cold. Hope to use it through the winter months. This is really good advice, particularly for newbies like my wife and I who just bought our motorhome in September and are facing our first winter with it.